Collection of Best WordPress eCommerce Themes for creating websites for online stores, eshops, catalogues etc. WooCommerce compatible templates with high quality designs for your future online business. Consider trying FREE Ecommerce WP Themes before trying PREMIUM! 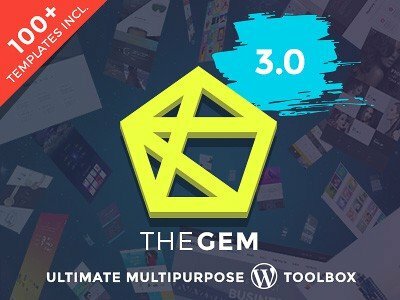 TheGem takes you on the next level of a top-notch online-store. This extremely beautiful and highly customizable, flexible and functional, responsive WordPress multipurpose theme is one of the bestsellers in 2019. TheGem is high performance, user friendly and highly intuitive WooCommerce theme for building professional and striking online shops. Aside from the typical eCommerce features it includes other useful functionalities such as catalogs and wishlists, multistep checkout, retina ready images, efficient store management, built-in order tracking system, built-in coupon system and much more. Moreover, you can let your customers leave their ratings or reviews about your product. Amazing Mega Menus in different styles are included to intuitively walk your visitors around your online store. Since TheGem is SEO optimized, you are guaranteed that your site will rank well on major search engines. With over 40 conceptually conceived demo website templates you can hit the ground running in a myriad different usage case, with over 150 template pages to fall back on should you require something extra. TheGem will definitely help you to acquire higher sales/conversions and it will take your business to new level. 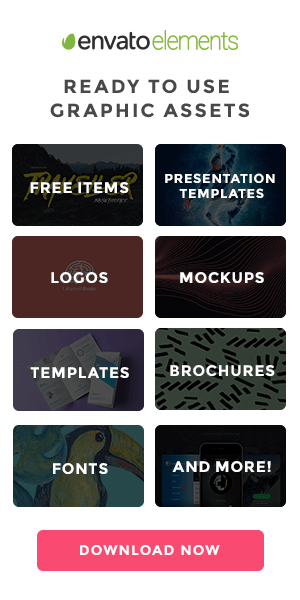 Divi is a multipurpose template and it includes an amazing ecommerce version as well. You can use Divi basically for any type of website, such as, portfolio, blog, corporate, creative agency, freelancer etc. Together there are 18 pre-made layouts which help you to kick off the work! Template is fully responsive and mobile friendly! It’s very easy to build because it comes with DIVI page builder which is pretty advanced and easy to use. You simply drag & drop elements, add any number of rows or columns and manage elements at any time! With page builder you can create unique website layouts with no coding skills in couple of minutes. Once you create layout you really like you can save it and use on another page or website as well. Divi is very secured template and it’s been awarded on Sucuri.net. WordPress template tends to be attacked every single day and security factor is really important nowadays. Divi also comes with excellent documentation, support team and regular updates. Check out elegantthemes marketplace and their great membership deals, I’m sure you’ll find something suitable and you get much more than just 1 ecommerce theme for a reasonable cost! You have probably heard about this Multipurpose WooCommerce Template. It has already helped thousands of people to create their online-stores in the easiest way ever. There are some components of this marvelous ready-made solution that make it so unmatched and impressive. To begin with, it will be possible to choose from multiple creatively-designed skins. Without a doubt, you are going to find something that suits your specific topic. In its huge package, you can find eye-catching demos to showcase such popular topics as gadgets, lingerie, furniture, tools, jewelry, cosmetics, sports, fishing, toys, and others. There are also some variations of the homepage that are capable of boosting your sales. It will be also possible to take advantage of various collections layouts and product pages. One more thing that should be adored by those people who want to sell lots of fashionable clothes on the Internet is Lookbook. You probably know that it allows creating hot-spots on the images which makes it quicker for visitors to find all necessary pieces of information about items. Moreover, all essential plugins and widgets are included in this excellent eCommerce solution. Thanks to a fully-fledged Elementor Page Builder, you can create your own single product pages, archive, and shop templates. It is also possible to add the price range, data range, select, checkbox, and search filters to any pages that include products. Keep in mind that this incredible ready-made template is installed in a few clicks. It also allows you to feel great freedom of customization even if you are not experienced in coding and its tricks. TIP: Check out some tips for successful ecommerce website before you start creating your sales strategy. Porto is one of the TOP on themeforest since 2014. This template has been rocking it and been sold over 20,000 times. That means quality! You can’t go wrong with theme which is being used by so many customers. Every possible bugs had been fixed and the new ones are fixed within few days. Porto is a multi-purpose theme with focus on business and ecommerce. It comes with amazing ecommerce features that make it one of TOP 5 in the category. Based on the author’s recommendation, here are 6 strongets aspects of PORTO: 1. Performance (high speed). 2. 20 different ecommerce variations (demos). 3. Powerful admin 4. Customer reviews (4.9 out of 5) 5. Works fast even on cheap hostings 6. Always updated (can be automated). Theme comes with full set of features, such as drag & drop builder (visual composer), vertical mega menu, category pages, sliders, sidebar options, 50 premade demos, RTL support, CSS animations, TOP support, detailed documentation, endless layout options, smart demo content importer, etc. It’s ideal for WordPress newbies but also for advanced WP user or web developers who would like add some new extensions. Since the code is very well organized it’s quite easy to code in some extra ecommerce improvements and features. What else? We leave it to you, just have a look on themeforest and click to see the live preview. You will be convinced very fast. In case you are not sure, just submit a pre-sale question to the author on TF. Also don’t forget to leave a proper review after you try it out! 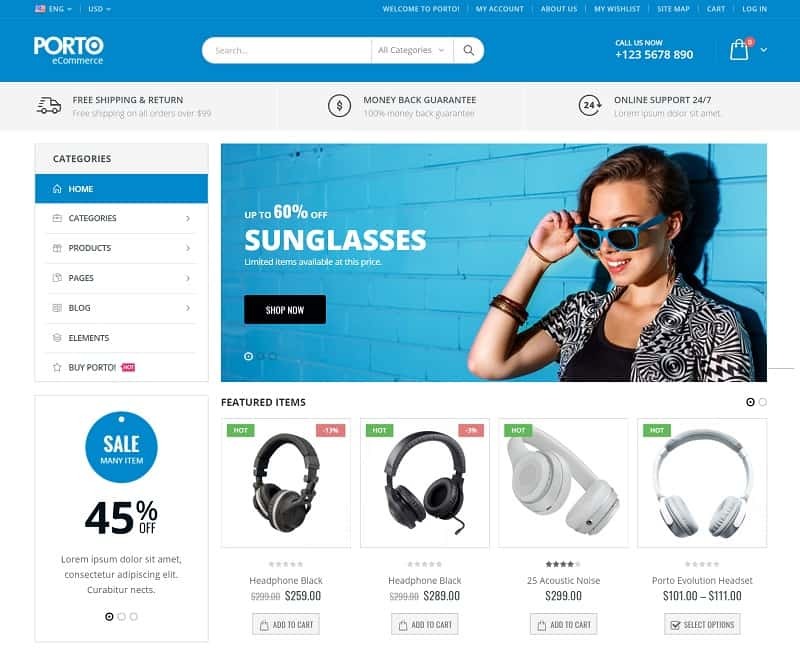 Supro is modern & stylish ecommerce WordPress theme ready for your shop website in 2019! It’s a highly rated product from themeforest which is slowly becoming of the best sellers in its category. Theme comes with minimalistic elegant design which is presented for fashion type of store but can be used for many other types as well. It comes with 18 unique pre-designed demos that are made for shoe store, digital designs, furniture shop, accessories or home decorations. You won’t be limited just to fashion! High performance and clean code are important elements of Supro theme. Loading time of the homepage is only 1.5s which each more than 90% of websites. This is crucial part of the conversion, website engagement and eventually great results in search engines as well. Supro comes with all important technical features, such as mobile friendliness, 1 click demo import, page builder (drag & drop), instagram shop integration, live search, quick product preview, advanced blogging and much more. Check out full description on Themeforest and don’t forget to swing on live preview as well. It is possible to discover fresh opportunities in terms of WooCommerce themes for organic online-stores. In the case when you have such a vibrant and attention-grabbing solution. It comes fully-loaded with all amazing instruments needed to build an excellent website connected with healthy food. In order to make your online-store look delicious and unforgettable, you need to take advantage of different helpful tools. There are many pre-designed pages included in the package. Among them, you can find superb variants to introduce your products, describe their details, and do many other important things. You will also have a chance to share some additional information (for example, some brand new recipes) if you want. A great blog functionality allows realizing your goals and making everything at its best. Without a doubt, your potential visitors have various devices. Their screens differ from each other which means that your website should be rendered perfectly on all of them. A fully-responsive design makes sure that a visually-attractive appearance will be saved on both small and large screens. There are also such useful instruments as a WooCommerce Ajax Filter, Compare & Wishlist, and Quick View or you can take advantage of compatibility with live chat plugins for WordPress. All of them are crucial if you have an aim to sell products and services on the Internet. You can also pay your attention to various bonus images. They are considered to be a great fit for your online-store related to food and its production. If you do not want to search for some relevant photos on the web, you can always use those ones included in the package. Halena is modern ecommerce WP theme for creating amazing online store websites. It comes with beautiful minimal design which is highly professional with purpose to perform very well when it comes to conversion and sales. Halena comes with 4 pre-designed homepages which are truly professional and ready for various types of online shops. You can easily install and adjust them to your need via demo data and visual composer. No need for coding skills and you will save plenty of time as well. 4 demos present furniture, creative fashion, classic nordic and modern clothing but theme is pretty much flexible and can be used for any kind of eshop. Stick with those designs and use them for inspiration! What else? Them is packed with other important ecommerce features, such as, AJAX product filter, lookbook options, ajax search, WooCommerce Themes, catalog mode, single product styles, revolution slider and many more. Everything is documented and very well coded in order to make your work easy, even if your are using WordPress for the first time. Make sure you visit live demo to see how theme is performing on various devices and how it suits your needs. Good luck selling your products! Sober is a premium, unique and modern WordPress theme with focus on e-commerce. Whether you are selling clothes, vitamins, tools, camping accessories, toys, furniture, surfboards, fishing or sport equipment, Sober is here and ready to help you build a powerful online shop with clean design that customers love. It is important part of successful on-line business that visitors feel comfortable while browsing your products. Sober’s online shop has several clever addons already built-in like shipping calculator, wishlist, filter, tracking system, report system and more. Built with bootstrap and fueled by Visual Composer one can create almost any design. Theme comes with more than 12 pre-made home-pages all beautifully crafted with focus on details (Minimal, Modern, Classic, Clean, Categories, Best Selling, Parallax, Full Screen, Full Slider, Home&Gift and more coming soon). With the one-click import demo content feature it has never been easier and faster to create something that will take breath away instantly. This premium WordPress theme is fully responsive and when browsing on mobile it almost looks like you are using app. Visual Composer (most popular drag&drop page builder in the world) and Revolution Slider (one of the best Slider plugins out there) as parts of this versatile product allows you to create stunning product pages with unlimited header styles, built-in live search and product quick view. Sober is soo ready. It is ready for the latest SEO practices and Google recommendations, it is translation ready, it is ready to be turned to become unique and it is ready to help you to sell whatever you are selling. Theme is very fast which is very important part of good SEO tactic. With Sober you will get regular updates, extended documentation and dedicated support team. DEERSMART is ecommerce WP theme which is ready for different types of eshops. You can find pre-design versions for fashion, electronics, tech products and other types of niches. Theme offers different types of very interesting layouts for your website homepage. You can list your most attractive products, categories and discounts in very creative ways in order to make amazing impression, lower bounce rate, increase engagement or promote your brand in very professional manner. Theme comes with great performance and loads only within 1.79s (homepage test) which is great for engagement, conversions and search engine rankings as well. You can count on reliable support, documentation and regular updates. Theme can be built within few clicks and also designed by installing demo data. After that just adjust colors, pictures, branding and start adding your own products. What else? You won’t miss any important ecommerce features for your future online store website in 2019. Listing all features would be never ending process but we can ensure you, nothing is missing for “small ecommerce business”. Make sure you visit live demo and play around with actual live theme. That will give you the right feeling if this is perfect fit for your project! Blance is great WP ecommerce theme for beginners or advanced users. It comes with clean and minimal design which looks professional and give the website good credibility. Your visitors will convert very well into buyers and your sales will grow easily. You can choose from 6 different pre-designed homepage layouts which can be installed easily via demo data import. That will save you plenty of time and will do lots of work for you. Blance comes also with online documentation which will help you build your website step by step and customer supper in case you end up struggling with the theme. What else? You can find awesome features, such as, product variations swatches, powerful ajax shop, instagram shop, mega menu, ajax search, visual composer, translations, product video tumbnails, social login and many other important stuff for ecommerce business. Make sure you visit live demo and test theme functionality by yourself. Good luck with sales! Storefie is another well developed WP ecommerce theme with bunch of different looks and pre-designed variations. Theme comes with 4 main demos focused on Outdoors, electronics, bicycles and furniture. You can always adjust design and use the shop for other purpose. Don’t feel limited, just use your imagination. Template is designed with ecommerce conversion in mind and brings high results in sales. It comes with bunch of usefel ecommerce features, such as sale countdown, stock status bar, sale filters (date – category), stock alert, shop views (grid, list and table), last sold products, advanced search, wishlist, upselling / cross-selling options, product comparison and bunch of others. Storefie comes with all standard premium theme features, options and couple of FREE plugins. I would suggest to look at demo version and make sure if it fits your needs. In case you have some doubts, just contact author on themeforest and submit your pre-sale question. If you are looking for professional online solution for your shop, don’t look further. All you need is modern and highly converting website which will help you to boost your sales. DeerMarket is professional / fully functional ecommerce template for WordPress platform. It’s been designed mostly for fashion & electronic industry. It comes with all eshop features you can imagine, plus it acts as a market not just a simple shop. There are 5 pre-designed homepages which will save you plenty of time because they include most of the graphic work, required for website. All the layouts, colors and demos elements are already there. All you need is proceed 1-click demo install and start customizing demos. Don’t waste your time, building from the scratch. Grab documentation and go through admin custom options to understand the concept and you are half-way there. In case you don’t understand something or you don’t know how to make some changes, drop a line on support forum. DeerMarket comes with bunch of important features, such as, optimized code, visual composer, responsivity, multi-vendor plugin, header & footer options, ajax product search, etc. You won’t find anything missing for building proper eshop! Visit live demos and get your opinion straight in order to buy theme as close to your expectations as possible. Themes only cost 50-60USD but you don’t want to waste your time by picking up a wrong theme which you will need to rebuild too much. Handmade is one of the best WordPress ecommerce themes from themeforest for shops with handmade products. Very elegant and clean design can present your products in stunning way! You can choose from 8+ pre-designed homepages which gives you great opportunity to build an amazing website in couple of hours. All demos are available in live preview and they bring different types of color combinations and layouts. Template package comes with premium support, documentation, updates, PSD files, revolution slider and visual composer for FREE. Your shop will run on powerful redux framework which is very stable and has powerful admin area. You can boost your menu with mega (xmenu) menu which is built-in template. Handmade is definitely one of the best solutions for you online shop! It’s also fully responsive and ready for online sales. Most of the traffic comes via mobile nowadays, so make sure your website design looks great on mobile devices. Handmade is product of G5Theme which is one of the elite authors on TF! Feel free to drop pre-sale question and go through all live demos before you make any decision about your purchase. YourStore could be just another WooCommerce theme, just another fish in the sea or another brick in the wall. Could be but it isn’t. YourStore is a product with great versatility, modern look and advanced functionality. Everything works and almost everything is easy. The user experience with the powerful admin panel is very positive and browsing pages is smooth and fast. Stop looking, you found a great theme to create your on-line business dream. YourStore comes with more than 14 amazing layouts and new modern skins are coming out pretty frequently. It is a toolbox full of useful stuff such as premuim plugins and extensions. Slider Revolution (super cool Slider maker), Visual Composer (best drag & drop WP builder in the word), WooSwatches (WooCommerce color or image variation swatches) or Templatera (template manager for Visual Composer) in total value around $80. It is compatible with WooCommerce Wholesale Prices plugin. The customization options are almost never ending. All the combinations available within few clicks and in few moments. A very important thing when you own an on-line shop is its look and the first impression. Set up your store as you wish, use all the pre-made layouts available, listing and product variations and make your clients comfortable, give them the experience they are looking for. No one wants to wait for a long time, especially when doing on-line shopping therefore speed is important conversion factor. Guys from Smart Data Soft knows it and they made YourStore really fast. The code respects all the latest SEO practices, it is fully responsive, retina ready and supports non Latin languages. With purchase you get an access to online documentation and a help of support team. You can’t go wrong with YourStore. Merchandiser is another ecommerce theme by popular author from themeforest called getbowtied! Their team definitely produces best solutions (products) in ecommerce category. They have currently 4 highly professional themes in their portfolio and you can create fully functional eshops with them in few hours! Getbowtied offers TOP support for their customers by creating amazing step-by step documentations, valuable updates and customer support. With 3 years of experience and more than 20k sales on themeforest you can be 100% sure about the authors qualities and support! Merchansider comes with super simple design and advanced customizer which allows to build up your web easily, with no coding skills. It’s full of ecommerce features, such as, off-canvas shopping cart & quick view, different types of galleries, affiliate marketing options, digital downloads, customer reviews, stock management, catalog mode, payment gateways and other handy stuff. Theme comes with friendly code, powerful HTML5 framework and with focus on speed! It loads very fast in order to bring great user experience to visitors and rank well in search engines. Make sure you visit live version and test the functionality by yourself to get direct user experience. It will ensure you if it’s right template for your ecommerce project. In case you’re not sure submit pre-sale question or visit other templates in author’s portfolio and compare the options. They are all TOP works! Umbra is very modern ecommerce store wordpress theme which can be used for various types of shops, such as, fashion, furniture, clothing, shoes etc. It comes with bunch of pre-designed template within the package which you can easily import with demo data just by one click. They are fully designed and functional, you just need to adjust design and of course add your own products. Theme comes with bunch of amazing built-in extensions, such as, mailchimp (to gather emails and manage your newsletters), WPML.org (to translate your website into other languages), slider revolution (to create great first impression and slides on your pages) and visual composer (to build layouts and content in just few minutes). You can build your ecommerce website with no coding skills just basic PC common sense. Everything is pre-made and functionality is truly enormous. Just follow step-by-step documentation, stay in touch with developers on support forum, update your theme for FREE when it’s need and get your online business going in just few days. There are bunch of other useful features, such as, PSDs, SEO optimization, live customizer, quick product view, 4 headers, 2 footers, full responsivity, right to left option and much more. Feel free to visit the main page and and live preview in order to get to know the product better. You can also submit pre-sale questions to the author if you’re not sure about the theme options or functionality. Basel is an ultimate WP ecommerce theme with modern and trendy design which will attract new customers for you. Theme is very powerful and full of amazing ecommerce features but still very easy to use. You don’t need any coding skills in order to get the job done. Everything can be managed by drag & drop page builder, shortcodes and woocommerce plugin. You can have fully functional, professional eshop done in just a few days. Theme can fit different types, such as, furniture, clothes, electronics, jewelry, accessories etc. There are 13 pre-designed demo layouts which can be easily imported by just 1 click. You will save a lot of time with those demos, since they are fully designed and set for various eshop purposes and layouts, such as, wine store, fashion, bikes, flat, minimalist, watches, etc. With upcoming updates you can also expect new layouts for FREE. Basel is fully ajaxed and you will definitely appreciate functionality. What else? Basel comes with other main features, such as, 100% responsivity, revolution slider, visual composer, WPML compatibility, tons of headers, 360 degree product view, color swatches, hover effects, quick views, custom HTML, SCSS, customer support, online documentation etc. You can visit live preview of all individual home pages. Make sure you take advantage of this options before any purchase decision. XSTORE is super advanced ecommerce WP theme with professional features and trendy design! It’s very easy and intuitive theme which allows you to build your online store with no coding skills. Theme comes with pre-developed & designed demos which fits different types of eshop, such as, sunglasses, clothing, bikes, tools, weddings etc. Everything can be easily imported with demo data content. Good news is that it takes only 1 click. If you follow included documentation and support forum, you won’t have any difficulties to get the job done. What else? Theme comes with great features, such as, revolution slider, visual composer, wpml compatibility, contact forms, product hover effects, catalog mode, versatile header styles, powerful admin, additional page editors, lifetime updates, multicolumn product grid, etc. XSTORE is fully responsive theme which is professionally adjusted for mobiles in order to convert effectively! Theme runs very fast and its performance score 96% in page speed and 80% Yslow speed, which are important factors for SEO rankings as well. XSTORE has been developed by experienced author from themeforest. 8theme team is one of the power elite authors what is definitely factor of high quality. I recommend to visit item’s page to check more details, contact author with pre-sale questions or preview live demo version of XSTORE! Fairy Style is a WooCommerce theme for online clothes stores. It has a full WordPress Customizer support, which makes it really easy to adjust to your needs. You can see the changes live, without re-loading the page. All of the elements look great no matter which option you choose. The theme is built with Bootstrap and is fully responsive. You can browse it on any device with any resolution, and your site would still look great. Fairy Style has hundreds of options in the Customizer, including the layout positioning, social icons, color-scheme, typography (choose from over 500 Google Fonts!). The theme comes with custom widgets for displaying your products in a compelling fashion. This includes a product sorting widget, which allows you to choose items based on a certain criteria, a product carousel widget, which displays your products in a carousel slider, and others. Fairy Style is SEO optimized thanks to the valid code structure and semantic coding. This makes it ready to rank high in search engine results. You can install Fairy Style on unlimited number of websites, since it is licensed under GPL v.3. The theme comes with lifetime 24/7 support and unlimited updates. Cayto is professional WP theme for ecommerce website, such as, catalogs, online stores, eshop with any type of products or services. Demo versions are mostly focused on fashion but theme can cover other industries as well. There are 8 different homepages available with plenty variations and trendy elements divided in sections. You can easily import all demos into your wp theme installation just by 1 click. Then you just pick your demo and change your content and pics. Everything can be done in visual composer just by dragging and dropping of the pre-designed elements. In VC you can easily change layouts or create new ones from the scratch. No coding skills needed, just common sense. There is detailed documentation for the theme so you don’t have to be worried how and where to start, just follow the steps and contact support forum of the author. What else? Cayto comes with bunch of other features, such as, icon & google web fonts, multilingual compatible, unlimited colors, revolution slider, HTML5 & CSS3, great performance & loading speed, social media sign up, FREE PSDs, quick view product, mega menu, and much more. Feel free to jump on live preview and find out more about Cayto + you can test user experience on your own. Electro shop is another fenomenal ecommerce WordPress theme focusing on electronics industry. It’s been out on marketplace for only few weeks but there is huge demand for it, since it’s very complex and packed with the best ecommerce features you can possibly need for an eshop these days. Don’t limit yourself and feel free to use theme for other industries as well. You can definitely fit in fashion, jewelry, accessories or other types of products. What else? There are bunch of useful features, such as, product live search, brands & products carousels, wishlist, compare list, advanced review system, different layouts for single products, catalog mode, shop jumbotron and much more. Electro shop comes with 3 different homepage layouts, which are pre-designed for your needs and you can easily import them from demo data just by 1 click. You can also take advantage of other pre-designed elements, such as, 9 sub-pages, 9 color schemes, 4 header styles, mega menu styles, 3 blog layouts, 3 product pages, etc. It’s very professional and inspired by the most popular online stores, such as, amazon, aliexpress, ebay etc. Electro shop is made to be easy and yo don’t need any coding skills to get everything ready! Just follow included documentation which will guide you step-by-step from installation to setting up product pages. There are bunch video tutorials available as well which pretty straight forward and easy to follow. In case you need more help with your ecommerce website, feel free to take advantage of FREE support provided by author of the theme. Don’t hesitate, visit live demo and try out real experience and speed of the theme. Mr. Tailor is another high quality ecommerce wordpress theme by getbowtied, one of the best sellers in ecommerce category on themeforest! They released new big update recently called Tailor Version 2. The update was based heavily on user and storekeeper feedback. Basically, they have taken a premium WordPress theme and practically reinvented it to make it even better. As the other themes, Mr Tailor is built with the eCommerce functionality in mind and comes with a powerful Theme Options Panel, and Visual Page Builder. Mr. Tailor comes with bunch of different types of pre-designed demos, such as, indie, startup, wide / boxed style, lookbook, parallax etc. Template comes with most of the regular features, such as, visual composer, slider revolution, header options, 650+ google fonts, adobe typekit integration, child theme, WPML translations etc. With premium plugins you’ll save around $50 because you can find them included in theme for free. There is a lot to mention, when it comes to this great theme! I definitely recommend to jump on live demo and experience everything by yourself. Mr. Tailor almost 4000+ sales and such a huge number can ensure you about the quality of this ecommerce product. If you’re planning to build outstanding and professional looking eshop, Mr. Tailor is your choice! Shop Isle is first FREE ecommerce theme in this collection and first FREE template on my website as well! It’s from theme isle marketplace and it’s truly great product. It comes with clean code and amazing responsivity. Template is mobile friendly, compatible with all browsers and ready for any type of browsing device (laptops, mobiles, tablets etc.). Definitely worth considering when you’re planning to build online store. Shop isle is pretty universal and you can fit it to any type of shop, such as, clothing, jewelry, shoe shop, electronics, art, etc. Don’t get stuck just by lack of creativity! Template is very clean and professional looking what’s great factor for your user experience. This type of layout & design raise trust factor and eventually you sales as well. Having an easy to use eshop with clean design is essential when you want to succeed online in ecommerce industry! The Retailor is an old school theme released 3 years ago but still very popular on themeforest. It’s been one of the best sellers in its category and has over 11k happy customers. Over that period, it has gone through plenty of technical and visual updates which are always available for FREE. Theme is developed by getbowtied team which is definitely leader of ecommerce category. You can use it for different types of online shops, such as, fashion, sport, electronics, food, etc. The Retailor comes with bunch of TOP features, such as, visual composer for building page layouts, full responsivity, easy installation or one-on-one support! Theme is quite suitable for beginners because it comes with detailed documentation, video tutorials and guides for wp newbies. No coding skills required! There are tons of cool ecommerce features, such as, variable products, digital downloads, affiliate business options, product reviews, business insights and reports, catalog mode and much more. 2 premium plugins are included for FREE. You can save up $59 on visual composer and revolution slider. I would definitely encourage you to visit live preview of the theme and have a detailed look around the subpages and features. Live demo is pretty much authentic user experience which visitors will have on your website. The Retailor is professional solution for your eshop with high quality of code and customer support. Having clean, sorted and PRO looking ecommerce website is essential for that industry nowadays. Shopier is multipurpose wp ecommerce theme which is becoming very popular on themeforest. It’s very flexible and you can use it for plenty of different types of eshop. You can sell pretty much everything with shopier, for example, accessories, digital products, fashion, jewelry, foods, furniture, sports… anything you can think of. It comes with bunch of different demos with very advanced ecommerce layouts. You can choose from different sections, wide or boxed, different sidebars, minimal showcases, sales presentations etc. Shopier is packed with tons of features and it’s endless to list all of them. You will definitely appreciate visual composer which is premium plugin for building layouts and adding content. It’s huge time saver and it allows you to do work with amazing results, not even touching a single code. Shopier comes with bunch of pre-designed header & footer layouts which are very fancy and will attract your visitors straightaway. What else? There are other amazing features which every eshop developer will appreciate, such as, easy importing, mega menu, drag & drop cart, exclusive toolbar, 100% responsivity, quickshop ready, redux framework and other high quality features. Quickshop is definitely very impressive and user experience is very smooth. It’s not very common feature but I think sooner or later, every eshop will have it. Feel free to visit live preview and test it by youself. I can guarantee, you will fall in love with shopier theme as I did. Jewelry version is must see demo, it’s so professional and looks outstanding. Theme is suitable for beginners and comes with all benefits of premium theme. Well done documentation, online customer support and regular FREE updates for lifetime. Woocommerce plugin covers most of the ecommerce functions, it’s very easy to use and comes for FREE as well. Jewello is a stunning WooCommerce theme for a jewelry eCommerce store. The main advantage of the theme is that it’s really easy to setup and customize. It features a full support for the WordPress Customizer, so that each design option looks beautiful on any type of layout and screen resolution. It has a set of custom widgets that allow you to showcase your products in various ways, e.g. through a carousel widget. You can also sort your products by categories. Jewello looks beautiful on any type of device, which also means it would get higher rankings on search engines because of its responsive mobile-first layout. The responsive layout and the fact that it’s fast and lightweight makes it a great candidate for hitting that top ten high score on Google. In fact it has scored 85+ points on Google Page Insights! In addition to that, Jewello includes 24/7 lifetime support, and has a very thorough documentation that walks you through each step of setting up your theme. You can also easily update your theme with the newest update releases from templatemonster which come for FREE. It’s definitely one of the best ecommerce themes on that marketplace and I definitely recommend to check it out in live preview to experience all that beauty and professionalism. As author says, “designed by top industry leaders coded by geeks for humans”. You just can’t go wrong with that! Woodstock is another wordpress ecommerce theme which has been released on TF recently. It comes with very trendy and clean design which will show off your professional products in detail. Woodstock is pretty flexible and you can also you use it for fashion, furniture, watches, clothing or other types of ecommerce shops. Theme comes with visual composer and the means you can easily get your layout and customization done without touching the codes. Woodstock is fully responsive and mobile friendly. It comes in 2 main color version, light and dark layout. What else? Let’s get to some interesting ecommerce features. Amazing ajax search for pages, products and posts will make your user’s experience amazing! Off-canvas shopping cart & mobile menu are also included and very essential for users. You can add featured videos or quick view option for your products and impress with something unusual. Checkout page looks very professional and converts very well. 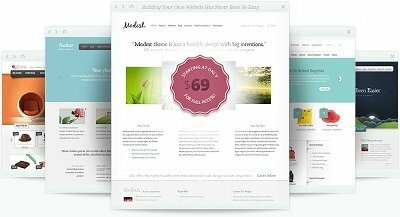 There are few premium features included in theme package which will save you $96! Visual composer, quick view plugin, master slider, revolution slider come 100% FREE. Pretty cool right? Considering that cost of the theme is only $59. The list of all theme features is literally endless and I definitely recommend to check out item’s page on TF for more details. You can also preview Woodstock theme live version which will give you exact user’s experience to find out if it’s going to meet your requirement or not. You can also contact authors and developers of the theme in order to find out more about upcoming updates and other details. Suprema is powerful & responsive wordpress theme for ecommerce websites. Theme comes with 16+ amazing pre-designed layouts which can come very handy for you. They can be easily loaded / imported via demo data content. You easily switch between them as well. Thanks to visual composer, you can also edit all of them and upload your content and pictures within few minutes. Visual composer is premium plugin which is coming for FREE along with revolution slider plugin. You save $53 with these two plugins because they are included in the theme package. Suprema comes with PRO ecommerce features, such as, user account, single product types, product presentations, variable products, multiply shop lists, wishlists, YITH product size charts, etc. Suprema is fully responsive, mobile friendly and compatible with most of the major web browsers. What else? There are bunch of other important features, such as, SEO optimization, tons of fonts & icons, smooth angle wipe loading, fullscreen slider, parallax effects, video support, multiply header, mega menu, social media integrations, portfolio layouts, carousel slider, tons of shortcodes, etc. Suprema is definitely TOP solution for your ecommerce project! Make sure you visit live preview and experience demo version! Luxury is universal wordpress theme with bunch of amazing ecommerce solutions. I’ve decided to add it to this collection because it has 8+ pre-designed ecommerce pages which are creative and very professional. They meet all the current trends and can fit various industries, such as, fashion, jewelry, electronics, clothes shop, etc. In total you can choose from 10+ different pre-designed demos which can cover bunch of different online projects. There are 3 premium plugins included for FREE. Essential grid, slide revolution, easy view shortcode save you $52 together. Luxury has unlimited variations of header styles which can come very handy when it comes to optimizing for first impression of your website. Theme is powered by some core features, such as, 100% responsivity, visual composer, mega menu, ready translations, RTL support, SEO optimization, 1 click install, etc. Luxury theme is super easy to build and with above already mentioned features you can get everything done in couple of hours, without knowing any developing or designing skills. Product pages come with handy features, such as, filters, product lists, single product styles, single product image styles, etc. Theme is fully documented and in case you need any help, you can take advantage of premium customer support as well. Lifetime updates can become very useful when it comes to improving, you will definitely need that in the future. What’s great is that you don’t need to update, it happens automatically. Make sure you visit live preview of all ecommerce demos and try them out. It’s definitely essential step before you make any purchase decision. You can also submit pre-sale question to the author of the theme about any upcoming updates, fixes or improvements. Just visit discussion on themeforest! Furnde is new ecommerce theme for wordpress from themeforest, most reputable marketplace! It’s been doing very well since it’s release, 200 sales in first 2 weeks can ensure you about the quality! There has been couple of updates since then so you can be sure that all the little bugs are fixed by now. Theme comes with very clean and professional looking design which you can see in 4 different live demos. All 4 pre-designed homepages can be easily imported and used, takes only few seconds. Whole content and layout can be managed with visual composer which is easy to use and doesn’t require any coding skills to get the job done. There are few other pre-designed layouts which you definitely appreciate, such as, 3 header layouts, 2 shop style layouts and 3 product layouts. Furnde comes with bunch of advanced ecommerce features, such as, simple / variable / downloadable / external / affiliate products, tracking system, tax options, shipping calculator, shipping options, storage management, insights, wishlist, product filters etc., everything you can possibly need! Two of the premium plugins are included and they’ll save you $40. Visual composer and revolution slider come for FREE in the package (unique verification codes are included). Theme is SEO friendly and ranks well in google. That’s one of the most important things you need to keep in mind from the beginning. If you’re after some modern looking ecommerce theme with design which can sell, Furnde is something you should consider. Visit live demo and try out most of the features and see how it feels, become visitor (consumer) for a moment. Make sure you follow newest 2019 web design trends to meet your visitor expectations. It will increase your website conversions and your online income. New-commerce is popular wordpress theme from mojothemes marketplace which is one of the bestsellers in its category. You can easily create fully functional ecommerce website without knowing the codes. Having eshop is not a big challenge nowadays, thanks to wordpress platform. They made it very easy for us and guys from woothemes created PRO plugin woocommerce and just gave it away for FREE. You also have instruction videos available made by author of the theme. How cool is that? New-commerce comes with bunch of amazing features, such as, 3d sliders, 3 different homepage versions, clean and modern design, 100% responsivity, wishlist, products compare, unlimited customization, translations and much more. There are 3x premium plugins coming in the package for FREE. Revolution slider, layer slider 5 and live chat plugin. Live chat is amazing feature which is quite an essential for every eshop. Customers love to get in touch before they make a purchase. Visit live demo and try it out! Ecommerce is nowadays all about branding and user experience. Make sure you spend enough time on optimizing of your conversions and A/B testing of your website features. These will be very important aspects of your business and eventually of your income. ShoppyStore is brand new wordpress theme for eshops realeased on themeforest in beginning of 2019! Theme is very professional and packed with every feature possible. ShoppyStore is also available in joomla, magento, prestahsop themes or OpenCart Templates versions but I definitely suggest to stick with wordpress platform. You can choose from 3 different homepage versions and 5 layout color variations. It’s super friendly, you don’t need any special skills to setup your ecommerce website. You can build layout and add content with visual composer, import demo data with just 1-click, use included documentation or ask the author for support for solutions. ShoppyStore comes with bunch of other cool features, such as, mega menu, RTL, boxed or fullwidth layout, full responsivity, tons of shortcodes, portfolio page, 17 custom widgets, multiply blog layouts etc. In terms of ecommerce features you’ll be able to use ajax pro cart, quick product view, deal countdowns, color swatcher and much more. All these essential parts of your marketing strategy when it comes product based websites. With ShoppyStore you’ll save around around $50 on revolution slider and visual composer because these are professional premium plugins, included extra in your package. Good news are FREE PSD files which will be helpful when it comes to presenting proposal designs to your clients. Visit live demo and make sure there is nothing missing for your requirements. Check the newest web design tips, 2018 ecommerce marketing strategies and start successful business online! ShoppyStore is ready to become online selling machine! VG Rossi is new wordpress theme for ecommerce ready on themeforest! It’s been quite popular last days and it definitely brings bunch of cool features and PRO design. Let’s see what’s VG Rossi can offer for your ecommerce project. First of all, there are 3 pre-designed professional layouts & 4 preset color skins. You can very easily set them up and switch between them anytime. Template comes with special ecommerce feature called woocommerce instant search which can boosts conversion with fastest search as you type product suggestions, relevant results and automated search filters. With VG Rossi you get some of the premium plugins for FREE. WPbakery composer, slider revolution, VG post carousel, VG carousel and mega menu save you $100. While installing and setting up your theme, make sure you follow documentation and contact author in case you need support. Keep your theme regularly updated to keep your eshop safe. Template comes with bunch of other essential features, such as, instant sample data, mailpoet newsletters, product quick view, wichlist, shortcodes, 100 responsivity etc. If you’re planning to build eshop for high quality products and show off your best products, then VG rossi is your ecommerce theme 2019. Another amazing wordpress ecommerce theme with very unique design. It’s super trendy and comes with every modern element you can imagine. Ideal solution for eshop with cool products for young creative people, such as, fashion, shoe store, handmade or electronics. There are 4 different professional looking homepage templates available. For your landing / above the fold part of the page you can use two different sliders, static or carousel slider. Template is fully compatible with the latest version of woocommerce plugin. You can take advantage of every single feature and get everything done very easily. Template is packed with bunch of amazing parallax & animation effects based on CSS3 and HTML5 what gives your website dynamic look. You can also choose from boxed or width layout for your website. Bow is also fully responsive what means it can adjust to any screen size screen or mobile phone. Template is fully customizable and comes with custom widgets, metaboxes, typography or shortcodes. Package comes with lifetime updates, PRO documentation and access to support forum of the author. I would definitely recommend to check live demo and play with animations, they are pretty catchy. Bow is totally great solution for your creative ecommerce website project. Let’s get your shop done and start some good sales. Gon is impressive ecommerce theme with bunch of cool pre-designed demos and tons of useful features. Everything you need to run your eshop is there! Template is also pretty much flexible and usable for other types of websites, such as, business, news, corporation, etc. Gon comes with 2 premium plugins worth of $53. Both revolution and visual composer plugins comes included in package and ready to be installed on you website. Gon is fully compatible with other TOP wordpress plugins, such as, bbpress, woocommerce, wpml! Template comes with bunch of pre-designed homepages what is definitely amazing for beginners! Within few clicks you can get your layout done. Pre-designed demos are, for example, supermarket, special collection, fullwidth parallax, catalog, lookbook etc. You can also find different layouts for blog, product pages. What else? Gon comes with some other standard features, such as, RTL support, 671+ google fonts, font awesome icons, mega menu, video & parallax backgrounds, 100% mobile friendly. Gon is user friendly theme which is easy to install. With one click demo import you’ll get you ecommerce project up in good shape in few second. Follow documentation, contact support, don’t waste time when you find yourself in trouble! Jakiro is very trendy wordpress ecommerce theme from themeforest! Template is very modern, minimalistic and professional. It’s best for fashion shop but if you like the layout feel FREE to use it for any other products, it won’t be an issue to adjust it. Try to keep your design simple and intuitive, it’s gonna boost your website conversion and bring you good sales. Jakiro comes with bunch of features, such as, responsive design, filter selection, 6 pre-designed homepages, 6 different blog styles, full woocommerce integration, WPML compatibility, RTL support etc. You get also 3 premium plugins for FREE. Revolution slider, visual composer and easy view shortcodes are worth 58 bucks but with template packeg come gratis for you. That’s a good deal right? Jakiro is very easy to customize and with visual composer you’ll be able to setup layout and add content within few hours. Are you ready to setup your online shop and start selling online? Jakiro si complete solution for that! For only 59 bukcs you get template, premium wordpress plugins, documentation, support and FREE regular updates. You have nothing to lose, check out live demo! Bishop is PRO wordpress ecommerce theme by teslathemes team! It’s the second ecommerce template in their portfolio which is growing quite rapidly these days. You will find their products definitely very useful and I would definitely recommend considering membership with them. Anyway, let’s get back to bishop. Template is loaded by amazing features, such as, unique homepage layouts, currency switch, visual composer, slider options, product filtering, demo data import, product popup, etc. Apart from that, bishop is very well coded and SEO optimized, plus as a bonus loading speed it very impressive. Visual composer and revolution slider are premium plugins worth of $50 but for you comes for FREE in that template package. Teslathemes team offers high level support which you’ll definitely appreciate once it comes to any issues while getting your shop website done. No coding skill are required for, you can get everything done in advanced admin and visual composer. Mobile responsivity is also covered along with browser compatibility so you won’t be loosing any traffic! MINDIG is one of the many ecommerce wordpress themes by sara_p from themeforest! All of their themes are very popular and definitely bestsellers in the ecommerce category. Template is packed with all necessary features for you eshop. MINDIG comes with 14+ demos which are ready to be used! You can choose from shop, corporate, portfolio or one page. Template also comes with unlimited header layout! What else? Bunch of other features are available, such as, fully brandable, visual composer, all in one plugin, maintenance page, quick product view, zoom effect, sidebar menu, full responsivity etc. From ecommerce point of view it’s definitely important to highlight features, such as, hover quickview, catalog mode, shop widgets, wishlist, compare products, etc. Template is SEO friendly and super fast what’s essential for good rankings. This fact can effect your online business the most. Keep eye on design and make sure you read some good ecommerce tips to optimize your website to increase online sales. Template is actually very friendly and easy to build. To get you websites done, you don’t need any designing skills or ecommerce experience. MINDING is premium template and comes together with documentation, updates and access to support forum. Good luck with your sales! Henry is professional wordpress ecommerce theme available on creativemarket for very reasonable price. From such a premium template you can expect high quality of the code, functionality and support team. You can adjust the them for any type of eshop with various type of products. It’s definitely very flexible ecommerce online solution. Template is 100% responsive, mobile friendly, compatible with most of the internet browsers and browsing devices. Make sure you visit live demo and try all ecommerce features there. It will give you exact idea if it’s gonna fit your needs and you’ll get some good inspiration on how to design you homepage and subpages. Templaza is author of the theme and they offer premium support on their forum. Just simply sing up for their forum and submit your ticket. While building ecommerce shop you might face a lot of different problems, especially when you don’t have much experience with wordpress. Therefore, don’t hesitate and take advantage of support forum. You’ll save plenty of time when asking for help from developers of your ecommerce theme. eStore is WordPress ecommerce theme made by elegantthemes team! Being member of their club is a little bit different story. They offer best support and high quality of their products for really low price. eStore is good example because it’s outstanding wordpress theme with amazing design features. It’s very easy to customize and you can setup you online store in couple of hours. Template comes with 5 different color schemes and tons of shortcodes which will save you a lot of time. eStore is running on very safe and quality code which is W3 valid and SEO ready! Template is responsive and compatible with all the browsers. You can download your updates anytime for FREE and they are always up to date! Get ready for shopping, get your paypal, setup your shopping cart and start selling you products. Shopme is perfect template for running an online shop! Live demo of the theme is pre-designed for medical shop purposes but you can of course adjust it to any type of shop. It’s very easy to install and manage. With one click demo data import you can get everything done much faster. Plus you can choose from 6 different pre-designed homepage layouts which will definitely helps you to get everything in order. Right under menu you can tuned your website with PRO revolution or layer slider which are premium but comes for FREE within template package. There are also other premium plugins coming, such as, WPML, mega menu or visual composer. All included premium plugins save you $86 and that’s more than price of the template. Shopme is fully responsive and mobile friendly. You can load template on any web browser and any type of device without any issues. It’s also SEO optimized and that can help you a lot with rankings in search engines and bring great amount of traffic. There is plenty of other features you will definitely appreciate while getting your eshop website done. Jump on live demo and check it out! Savoy is another amazing ecommerce wordpress theme with professional minimalist design. If you are looking for modern and sleek solution for your online store, savoy is definitely good choice. You can use it for different types of shops, such as, clothing, jewelry, digital etc. Template is optimized for online searches and SEO speed test passes very well. That means your chances of getting good organic traffic are much higher! Savoy comes with top notch support team, documentation and free automatic updates. Template is fully responsive, retina ready and compatible with all major web browsers. Savoy comes with bunch of premium features, such as, full AJAX functionality, advanced headers, product wishlist, high quality code, WPML translations, touch friendly galleries and slider, product quick view and much more. It’s definitely worth to click and try live demo version to see all the pre-designed pages and subpages. It’ll will give you real experience of the website. Velo is professional ecommerce template for creating websites running on wordpress platform. Template is design in bike store way but you can you use it for any type of eshop! It’s specialized also on niche products which need to be promoted in creative way to stand out from the crowd. Velo is fully responsive, retina ready, optimized for all devices and internet browsers. Template comes with 20+ pre-designed layouts which will save you plenty of time while customizing from the cratch. They are all very modern and trendy! That’s exactly what you’re looking for, right? Velo comes with bunch of other cool features, such as, ajax product search, 100% translations, review system, social integration, sales bubbles, SEO optimization, etc. There are also premium features included, such as, revolution slider, visual composer, woocommerce product layouts, woocommerce page builder and advanced custom fields. These 5 plugins can save you $98.5 when you pay just for theme! Velo is perfect soluton for ecommerce online projects and you should check out live preview. You can see all the product, checkout or payment pages. Merchant is ecommerce wordpress template with very modern design and tons of features. It’s very universal and you can use it pretty much for any type of website. With easy layout creator you can build you website very fast! You don’t need any coding skills to get you eshop done. Merchant comes with bunch of premium plugins which you get within the template package for free. They all cost 75 bucks and you get plugins, such as, revolution slider, advanced custom fields, 3 icons sets etc. Template is fully supported by dedicated team and it comes with detailed documentation as well. Merchant comes with very stylish product catalogs where you can present you amazing stuff. Template is designed mostly fo fashion shops but with little bit of creativity you can adjust it to any type of online store or website. In case you are concerned about functionality or if it’s going to fit your needs, feel free to jump on themeforest and drop pre-sale question to the author. You might come up with new idea which they might include in nesxt update. Enjoy working on your ecommerce store website and remember, sooner you start, sooner you start selling! Flatastic is very popular ecommerce wordpress theme with clean and smooth layout. It’s very well-known along other CMSs and you can download also drupal, virtuemart, magento and HTML5/CSS3 versions. Flatastic comes with pre-designed demos which can turn your website into PRO looking shop in few seconds. You can also use it for other types of websites, such as, corporate, one page, construction, interior etc. More demos are coming soon. Template is fully responsive, retina ready and optimized for all major internet browsers. Flatastic comes with visueal composer which is currently the best tool for building up content and layout. You can setup containers, drag & drop elements and add content in matter of few minutes. Another unique feature is premium chat plugin which is included for FREE. You can take advantage of it and chat with your visitors, use it for sales or support. Safeguard plugin comes for FREE as well and it will help you to keep your website safe! It’s very important when you running an eshop in wordpress. With these 3 plugins you’ll save 87 bucks. Time to speed up your ecommerce sales and get a new website for your eshop! Hugo is the latest ecommerce wordpress theme released on cssigniter.com. In my opinion, it’s one of the best templates they’ve released so far. Hugo looks very professional and trendy! All the vintage, hipster and minimal elements make it very unique and ideal for any online fashion stores. If you’re trying to build ecommerce website for your brand, you should definitely consider this amazing wordpress template! Hugo is fully responsive, SEO optimized, online documented, fully customizable, WMPL ready, loading speed optimized, retina ready and supported by professional team from cssigniter.com. Feel free to jump on live demo and try all the ecommerce functionality by yourself. Shopping with hugo is easy and fun. It comes with elegant blog where you can share stories about your brand, company, updates or products. Hugo is definitely one of the best ecommerce website solutions for fashion online stores currently! Cssigniter comes with amazing packages full of wordpress themes for just couple of bucks. It’s real time and money saver membership club! theShop is new ecommerce wordpress theme with very clean, modern and colorful design. It’s suitable for different types of eshops but it fits the fashion industry the most. You can choose from 10 pre-designed homepages and switch for your favorite very easily! It’s fully compatible with woocommerce plugins so you can run all possible features with it. Template is 100% responsive, retina ready and compatible with all devices and internet browsers. You can easily setup layout of homepage and subpages by using visual composer which is huge time saver! For first impression I would recommend to play and designed revolution slider to get your first visitors attention as soon as possible! theshop is designed to sell, what means there is high focus on conversion and user friendly interface. You should definitely check out live demo see it yourself. We all use online shops and we know how eshop and branding should look like! theshop is one of the BEST examples which you can easily turn to your ecommerce store! Why wait? Go and sell! You ecommerce store can looks just the same as the one on template. There are no hard coding skills required for building websites with wordpress! Elise is amazing ecommerce wordpress theme for eshops and other ecommerce related websites! It comes with very modern and trendy design which is styled in 4 different pre-designed layouts for you. It’s ideal for cosmetics store, man & woman fashion shops or luxury accessories and jewelry. Elise comes with bunch of amazing features, such as, multi color / layout, mega menu, color swatch, responsive design, ajax add to cart, wishlist, brand logo slider, product tabs carousel and much more. It comes with detailed online documentation and dedicated support team. Free updates you can easily download from themeforest through your account! It’s very important to keep your eshop update, meaning your wordpress, template and all plugins. You don’t need any pro skills to build your eshop with wordpress, most of the content you can create with visual composer which is super friendly! If you’re after small / medium store wordpress is the best and easiest choice for you. Bazien is one of the newest wordpress ecommerce themes with fully responsive and professional design on themeforest. Template comes with visual composer which is one of the most time effective solutions for wordpress developers / designers. VC comes with ultimate addons which allows you to extend for all the possible features. You can choose from 6+ homepage layouts with already pre-designed elements and colors. Bazien fits all types of ecommerce websites as well as blog, business or portfolio websites. Theme comes with bunch of other cool features, such as, awesome megamenu, retina ready & responsive, 4+ unique headers, google & icon font, 3 different shop pages etc. Bazien is SEO optimized and ready to rank you great products! Are you ready to get your ecommerce theme? If you think you can’t do it, you’re wrong. WordPress themes are very simple to use and there are plenty of tutorials out there. Plus, you’ll get your online documentation, dedicated support team and FREE regular updates. You basically don’t need any coding skills at all to build your ecommerce online store. Adot is professional wordpress ecommerce theme with outstanding layouts! You can choose from 9+ different demos which are all unique and very trendy. They did a great job with minimalism and colors and the way how it’s all connected resulted in couple of different eshop variations which are on high level! Cart and checkout page are very clean and very easy to follow. You can setup different sales countdowns and promote it on your homepage. With adot you can also run clean portfolio or just catalog of your products with no pricing. It comes with very stylish blog and you can choose from 5 different designs. Adot comes with bunch of other features, such as, fully responsive, revolution slider, drag & drop builder, HTML5, CSS3, bootstrap 3, SEO optimized, RTL support etc. Creating of the eshop has never been easier and you definitely don’t need any coding skills to do that! With wordpress you get your ecommerce website up and running in couple of days! Always take advantage of your FREE documentation, support and regular updates. All in one is amazing ecommerce wordpress theme with tons of features and it meets all requirements for building a fully functional online shop. It comes with few demos which can help with adjusting of your design! Premium feature, such as, visual composer, revolution slider and wpml come for FREE it saves you together $80 and that’s actually more than price of the template. All in one is fully responsive, retina ready, SEO optimized, touch screen optimized and much more. Regular updates, online support and documentation will help you overcome any technical issue. Don’t forget to update regularly and your support it’s always there, if you need any help! You can take advantage of other awesome features, such as, buddy press forums and groups, megamenu, HTML5, CSS3, jQuery light boxes, easy demo install, OWL carousel etc. Theme is universal and fits also different types of websites, not just ecommerce websites. It’s one the most popular themes in themeforest ecommerce section lately! It’s been rated very well so far and all the comments shows that author is loyal and getting this theme should be smooth experience. WooPress is one of the latest best sellers on themeforest in wordpress ecommerce themes category! It comes with advanced theme settings and trendy design. WooPress has couple of new improvements in comparing with other premium wordpress themes, such as, improved checkout process (try with live demo). WooPress is easy to customize and it’s also optimized for searches what will help you to start ranking quite fast! Theme package includes psd files, documentation, theme .zip archive, languages files, pattern, json file. Quite a load of stuff for only $58. WooPress is responsive and retina ready. You can take advantage of awesome premium slideshow and create TOP first impression element for your visitors. Theme is clean and minimal what helps you to showcase and highlight your products in online store. Kancing is another fashion wordpress ecommerce theme with impressive layout! It fits small businesses, online boutiques or company showcase. It comes with visual composer feature which helps with getting the layout done. Kancing is ideal for beginners because it’s very simple to use and the ecommerce part is very user friendly. It’s very popular within creative market and ecommerce related products. You can setup all important additional pages, such as, blog, testimonials, FAQ, Our Team and much more. Kancing comes with free online documentation, dedicated support provided by author and FREE regular updates. Don’t hesitate and check out live preview and experience this amazing template by yourself. It’s compatible with bunch of premium ecommerce extensions, such as, catalog mode, product enquiry, product quotation, product zoom and quick view. It’s very advanced template and it cost only 39 bucks. Kancing is definitely good ecommerce solution for you online project. It’s time to kick off your sales with your new ecommerce website. Flevr is TOP wordpress ecommerce theme from cssigniter shop! This premium template is very elegant and professional looking ready to sell website product. You can enjoy smooth developing experience with drag & drop builder and flexible layout options. It comes with 7 content types, such as, partners, portfolio, services, slideshows, services, features, teams, testimonials and so on. Quite a lot right? Flevr is SEO optimized what means that your titles and meta descriptions will appear on a right place and you content will load in very SEO friendly way! Template 97% in speed test and that’s really great number for keeping decent bounce rate! It comes with support, documentation and endless FREE updates. Flevr is responsive and you visitor will be easily able to purchase your products while using mobile or tables devices. Flevr is definitely professional ecommerce solution for your business and your products will stand out from crowd. Remember shopping online is still winning business and ecommerce is the future, so don’t hesitate. Oswad is truly professional ecommerce wordpress theme with bunch of amazing features and wide usability. You have pre-designed 5 totally different styles of supermarket. You can use it as business page, magazine, blog, portfolio, one-page type of page! You can find great stuff inside, such as, revolution slider, visual composer, bbpress or woocommerce! How cool is that? Template is fully responsive, build on bootstrap 3, WPML ready and fully customizable. It comes with detailed documentation on how to setup your wordpress shop from the scratch. Checkout page, shopping cart, product variations and all the other eshop necessities are included. All of these are easy to setup if you follow documentation step by step. Are you ready for your ecommerce store? Oswad is your amazing opportunity to make it happen. Try live demo and start installing your wordpress! Handy – is wordpress ecommerce theme with focus on selling homemade stuff but you can use it for any other types of eshop. It’s very stylish template with professional design which will sell out your stock very soon. Handy templates is full of amazing features, comes with amazing layouts and it’s based on powerful framework. I would highlight couple of TOP features, such as, 100% responsivity, woocommerce compatibility, revolution slider, wpml, charts, banners, catalog mode, unlimited colors and layouts etc. You can take advantage of great one to one support, online video tutorials and FREE update anytime it’s needed. You will definitely enjoy this template and working with it. It’s very simple and friendly for users and developers as well. Zorka is popular fashion wordpress ecommerce theme with minimal & elegant design. It comes with wonderful 11 different homepage designs and many options how to show case your work and products. X menu is build in and you can place any content in dropdowns, such as, links, text, widgets, shortcodes and images. You can choose from 10 different header styles as well. Portfolio options are also available. Zorka comes with other features, such as, revolution slider, visual composer, WPML support, google fonts, font awesome icons, etc. With visual composer and one click demo import your life will be much easier. Great bonus is also wishlist and compare plugins support. This can be very handy for your customers. If eshop is in your horizon and you can’t decide which template to pick up, Zorka is your choice. It’s definitely one of the BEST wordpress ecommerce themes released on themeforest lately. Rustik is best selling WordPress ecommerce theme on mojo-themes market place! It has 3 main features, it’s responsive, minimal and woocommerce ready. The author combined these 3 to an amazing template which looks very simple but when you look in to the backend, you’ll find out that it’s not. You can use 17 widget areas, 160+ admin options, embed you mailchimp, use 40+ languages, soliloquy slider, products filter etc. There are 2 different color schemes, light and dark. You can find many eshops with very creative and professional designs but minimal style is still very trendy and easy to use. People will fall in love with your products and brand, not with your website, but they’ll still like the simplicity of it. Neighborhood is popular WordPress ecommerce theme with tons of features and mind blowing amount of sales. It’s been rocking on themeforest for few months already! It’s made by amazing team of SwiftIdeas. They’ve released version 2 with bunch of new features, such as, mega menu, ilightbox, product zoom, etc. Template is very responsive and it’s very easy to fill up you shopping car and checkout on mobile devices! It comes with amazing swift page builder V2 which will help you build your pages with no coding skills. 2 cool sliders are included in theme and you can play around with them to create first impression moment on your web. You can add wishlist and catalog mode as well. Swiftideas offers 5* support what means if you’ll get into trouble you get help within few hours through their support forum. Zeon is top product of teslathemes theme and you can get their theme separately or by being in their club you can get exclusive access to all their templates and plugins. Zeon is the only ecommerce theme they have but it’s truly of the best! You can build up professional eshop with the most modern features and functions. It’s build on their Tesla Framework and it comes with PRO features, such as, revolution slider, custom posts, product list, shortcodes, social media support etc. It’s very easy to customize and you’ll be surprised how fast you get your website up and running and eventually selling. TeslaThemes team offers dedicated support which will be very handy for you if you get into trouble. You can save plenty of time by asking on their forum than trying to fix problems by yourself. Disclosure: This article contains affiliate links what means that if you click on them and purchase and item (product) or membership, we may receive commission from the sale. All reviews and descriptions are our own and we do not accept any payments for adding positive reviews. Thanks for sharing these themes! To be honest, I like more http://www.webstarts.com/ as a platform for eCommerce websites. I`ve already created 3 eCommerce sites based upon this platform. All of them are quite popular. Thanks for sharing this amazing list! Nice! Shop Isle is not avail (technical error). Hi! I’m Alexandra and i am part of the ThemeIsle and i wanted to thank for including Shop Isle into your article and i wanted to mention that now the theme is available on WordPress.org as well: https://wordpress.org/themes/shop-isle/. Thank you! The Furnde WordPress is selling on the author’s website now. Another Woocommerce WP theme for florist, accessories or jewelry, plant decration. I think it should be appreciative. Great collection, guys! How about checking out our latest baby NITRO theme specially designed for eCommerce niches, not just “demo”, but real template with child pages. Right now, it’s equipped with 12 niches, 3 comes later by the end of September. What a review! So many awesome themes, thanks a lot! Here is another source of excellent WordPress themes templatemonster.com/category/games-wordpress-themes , if you don’t mind. I created a blog of mine precisely with one of these themes and never regreted about that. Do u know any theme with these function? This is awesome all the information here is very useful. I was looking for a eCommerce themes that perfect for this year and glad I found some interesting theme in this blog. Hope this is good option. thanks for the tip. we will consider as a next addition.